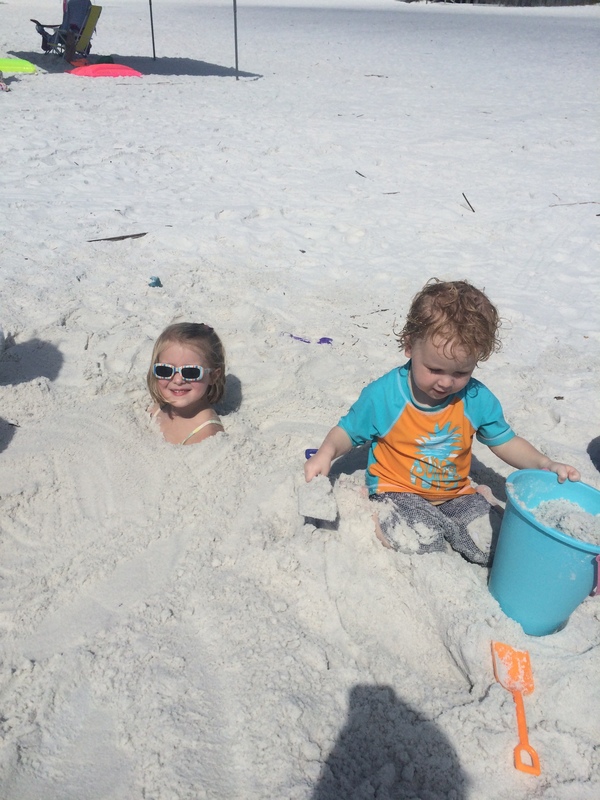 This summer, our family of five embarked on a great adventure! I like to call it “camping without the tent.” It was Will’s idea to take us to the Marriott in Muscle Shoals, and we were thrilled for the kids to experience their first night in a hotel. They nodded with wide eyes. When I described the hotel and showed him pictures online, he thought we’d be the only people in the whole place. Bless him! His sadness melted away when we walked into the lobby. One look at the grand fountain in the entryway and he was squealing. I had to pull his little arms out of the fountain and steer him to the elevator. He and Mary were completely enthralled with the elevator and gold luggage rack and bellman. When we opened the door to our room, Will and I were a bit surprised. We had gotten the last room in the place which, it turns out, had just one queen bed. We remarked about this to each other and Mary, who had never heard beds described in sizes, picked up on one word; “queen”. Poor baby Anna was irate not to be included in the queen’s bed. We woke up to her greeting us from her adjoining pack n play letting us know she wanted in. It was 6am. Will called down to the desk to ask what time the pool opened and the woman told us 7. Lucky for us! The pool actually opened at 8 and we were thrilled and shocked to be the only ones there. It is a huge pool with no entry, a real waterslide, bridges and fountains. We had the entire thing to ourselves, much to the surprise of everyone who got the memo it opened at 8. This was totally in line with John’s grand vision! The kids had never seen a breakfast buffet either and could not believe all of the options under those golden covers. They piled a massive amount of sugary cereals, pancakes and syrup onto their plates, and tried a few new foods too. It was like a royal feast for those of us who slept in the queen’s bed. We have been blessed to travel to some neat places this summer, but Mary and John agreed going to the Marriott was their favorite thing. Will and I cherish the memory and hold it dear. There is nothing more precious than seeing a familiar experience made new through the eyes of child! Lord, open our eyes to see the wonders of your world every day. Awaken us to see the blessings You give us with child-like appreciation. Captivate us with how You transform the ordinary into brand new. May we learn from our children to appreciate this amazing life, and appreciate You, our Amazing Daddy. Thanks for making us royal. Amen. 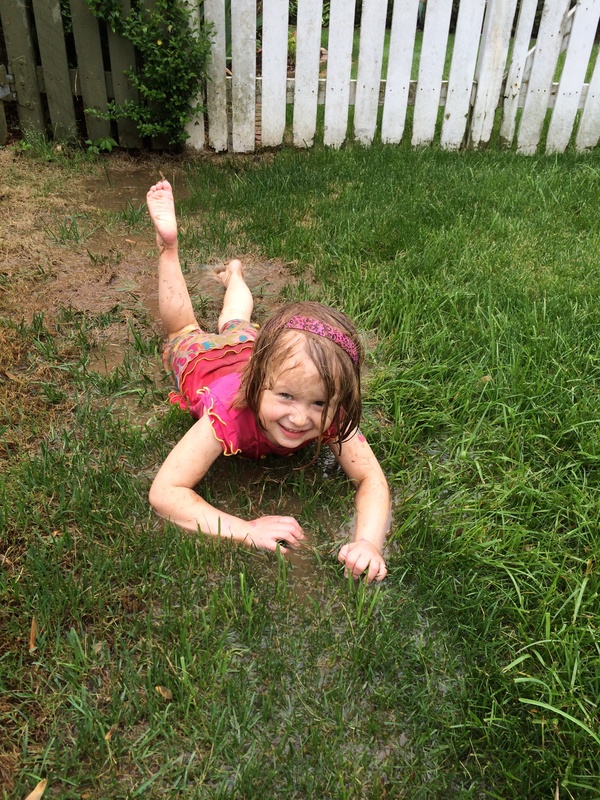 It was a day with little plans, overcast skies and a soaking wet ground; a potential bad combination for a mama! 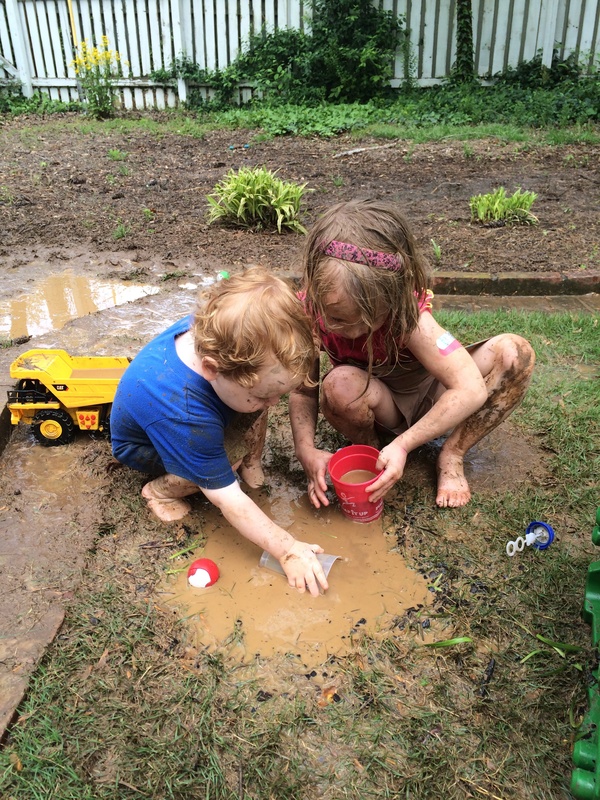 I let the kids out in the backyard to buy some time and figure out what to do with our adventure day. 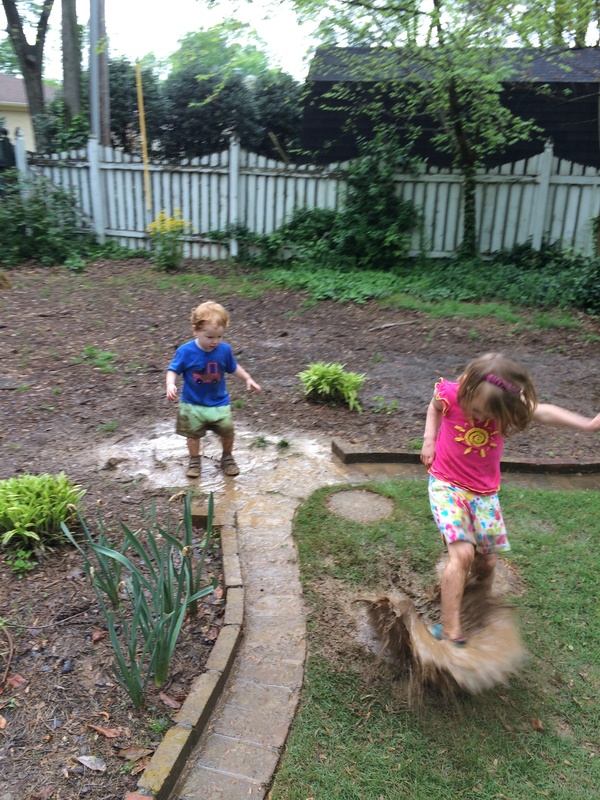 And within about 15 seconds, they found them….the two puddles in the back of the yard. And they plunged RIGHT IN. Oh dear! Too late to stop them! Do I run them inside and clean them off? Hmmmm. On second thought, we had nowhere to be and since they were already covered in mud, we made a morning of it. Boy, did we! They giggled and squealed and rolled around and had a ball. 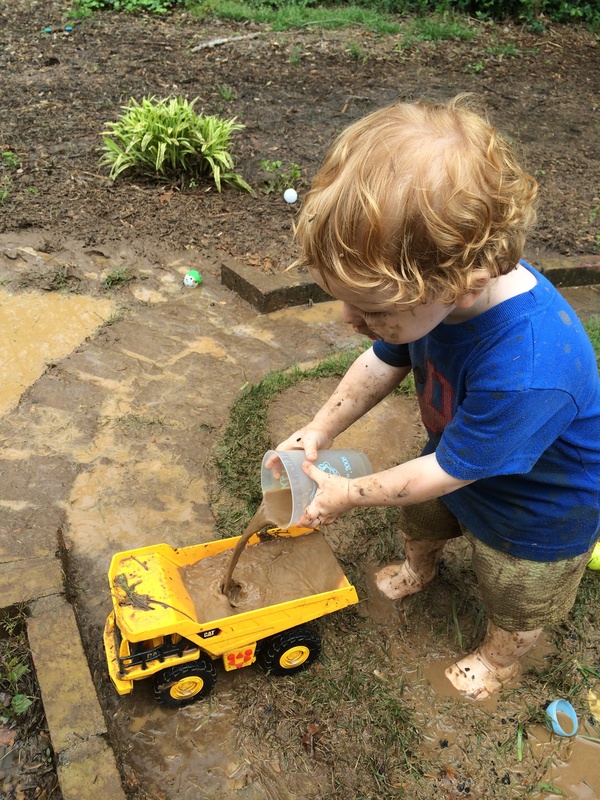 It brought back fun memories from my childhood of playing in the mud, and I still cherish the pictures my mom took to capture those carefree days. Will their new shoes ever look the same? Is the grass ever going to grow back in that spot? How will I get them into the bath without getting mud on the rug? What if I change clothes and get in with them?…No, a meeting with the financial people to talk taxes later and I’ve already showered. Those thoughts that came into my mind did not come close to my children’s little brains. They saw: Fun. Water. Irresistible adventure. So simple. They did not hesitate one minute to step into it. They did not think about their clothes, how they’d get clean or what came next. And why should they? They have me, don’t they? Has there ever been a mess I couldn’t clean up? They trusted I would be there to clean them off and make sure they are clothed tomorrow. Or, perhaps they intuitively understand that cleanliness is not an exterior thing at all. They trust they are taken care of…and they are…so they don’t worry. When God offers me adventures, do I jump in? Do I trust there is nothing to worry about because I’ve got Him? Or do I see all the reasons why not to? Do I see the abundant life He freely offers, or just the consequences of stepping in? How quickly we can talk ourselves out of what God puts right in front us. God puts these interruptions in our lives…people to share our faith with, ministries to give our resources and time to, people who are hurting on the side of the road…messes everywhere. And when we rationalize why we can’t go all in, we stand on the sidelines of an abundant life. Do we have to jump in to be more approved by our Father in heaven? Absolutely not! But we get to! And it’s more fun! He has called us to live in the present tense, to trust Him and not to worry, to follow Him right now, to become like little children and to enter His kingdom. Father, thank You for children. Thank you for telling us not to hinder them. Thank you for providing the most simple opportunities to live an abundant life in our backyards. Please open our eyes to the messes you would have us step into, renew our minds to trust Your provision, and give us childlike faith to let go of our worries and follow You in wild, pure joy.